To Sum It Up: After the plague that has decimated the population claims her mother, Eve is left orphaned and grows up in an all-girls school. Now ready to graduate and about to spend the next four years learning a trade, Eve is looking forward to the next phase of her life. But when she discovers the horrifying truth about what really becomes of the young women who graduate, Eve runs away. After years spent in the confines of her school, she must face whatever awaits her outside of it as she tries to make her way to what she hopes is refuge in a place called Califia. 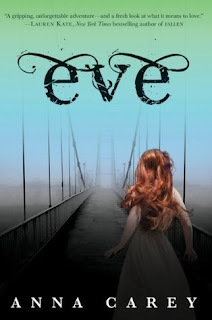 Review: Eve comes from the line of dystopian novels in which a plague has devastated the population, and there’s an appalling plan afoot to replenish it. Orphaned girls are sent to schools in which they’re taught to fear men; little do the girls know that once they graduate, they’ll be sent to another facility where they’ll spend years birthing baby after baby. Meanwhile, orphaned boys are put into labor camps. Like a few other dystopians I’ve read with a plague-based premise, Eve falters on the world-building. What was once the United States is now the New America, and it’s ruled by the mysterious King. Who is he? You don’t find out, at least in this book. All you do learn is that he’s after Eve, and his soldiers are out looking for her. As for the plague, it’s the catalyst that plunged the country into chaos, but it’s only mentioned when necessary to remind you that you’re reading a dystopian novel and it’s the reason why Eve was orphaned. Most of the book focuses on Eve bumbling about in a world that’s completely alien to her because she spent all those years sheltered in her school. Speaking of the school, its curriculum was all over the place. The girls take courses with titles such as “Manipulation and Heartache” and have to take a “Dangers of Men and Boys” exam, but they also read works like Anna Karenina and The Great Gatsby. Supposedly the goal of the anti-male education is to pretty much condition the girls into not wanting relationships, making them more compliant with the King’s Repopulate New America plan. Yet they’re allowed to read classic literature? In my mind, the two formed an odd combination. Someone who did end up being extremely naïve due to the cloistered nature of her schooling was Eve. Oh dear. Okay, I understood that her ignorance of the outside world was central to the story, but some of her actions really made me cringe. Thanks to what she “learned” in school, when she first meets Caleb, a young man living in the wilderness with a group of other orphaned boys, Eve fears that he’s going to throw himself at her. And then she’s insulted when he doesn’t. Eve might not have even run into Caleb if he hadn’t decided to rescue her from an angry mama bear who didn’t like Eve petting her cub. Eve remembers being taught in school that bears are dangerous animals, but this knowledge doesn’t stop her from thinking of the cub as Winnie the Pooh and wondering if she could keep him as a pet. I didn’t have much patience for Eve, and that was before I started noticing a pattern of Eve doing what was best for Eve, even if it meant other people getting hurt, which they did. So no, I wasn’t a big fan of hers. I did think Caleb and Arden, also an escapee from Eve’s school, were okay. I liked Arden quite a bit because she used common sense and was infinitely smarter than Eve was. Despite the world being fuzzy with the details and as much as I disliked Eve, the story itself was actually well paced. The writing was also solid. I believe, however, that one book about Eve’s escapades was enough for me, and I’ll be leaving the series here. All in All: Meh. Eve got on my nerves too frequently, and it’s tough for me to like a book when all I can think about is how much the main character annoys me. The world also didn’t quite add up, which is my number one pet peeve when it comes to dystopian novels. I know how you feel, I didn't like Eve either, nor did I enjoy the world. The plot felt a little too slow for me too. :P Just not my type. It's definitely not one of my favorite dystopians. Eve often frustrated me with her actions, and the details of the world seemed sketchy at best. Haha this Eve character is cracking me up. I think I'd DNF this. She was unintentionally funny, like when she thought she could keep a bear as a pet. Um, no, that's really not a good idea. Bummer. I had this one on my to-read list, but annoying main characters are something that I definitely can't read. Thank you for a great review! Think I will have to skip this one. Jaclyn @ JC's Book Haven. I understood Eve's naïveté to a point because of her upbringing, but then I found myself with less and less patience for her antics. Ouch. Sorry it wasn't impressive. Thanks for the honest review. This just didn't work out for me. I think I'll be keeping my distance from dystopians with plague/repopulate the world story lines in the future because I don't seem to have the greatest luck with them. I couldn't muster much sympathy for Eve; her self-importance turned me off quite a bit. Being limited to knowing only as much about the world as Eve did, which was very, very little because she grew up so sheltered, was also frustrating.